The first time Zackary Rath’s two wives spoke face-to-face was at his funeral in LA after his unexpected heart attack. Maggie had been Zack’s second wife for nine years, Angela, his first for thirteen, producing two sons, Martin and David. During the cab ride from the airport Angela remembered her last funeral had been eighteen years ago; her father’s. She’d wept quietly, but Zack’s gusty sobs during the eulogy exhibited a zest she found gratuitous though she couldn’t help but envy their sheer geyser energy. The cab deposited her at "The Pastures of Heaven," an enormous complex of marble and wood surrounded by bougainvillea and roses. Zack would have loved its unrepentant grandiosity. She stuffed her suitcase into a closet, then strolled "The Pastures" till locating a door labeled "Viewing of Zackary Rath." Inside, heavy gold carpet muffled her footsteps. A glass panel in the ceiling draped a beam of sunlight over Zack’s casket adrift in an ocean of plumeria, bird of paradise, anthurium; very cinematic. All Zack’s jobs had been in show business; promoting concerts, arranging screenings of independent films, representing actors, directors, singers, who had no talent whatsoever. He’d represented some people who won first prize in various "worst of contests" achieving a cult reputation for backing losers who were, so to speak, winners. Angela searched the room for her sons, grateful for the anonymity of being the ex-wife. She wore beige linen, but most of the women, tanned and slick as Olympic swimmers, wore sherbet shades, though she spotted some black sheaths. A few men wore suits, somber spots in a maze of chinos and Aloha shirts: the brightly patterned fabrics of palm trees and sweet, alcoholic drinks. To be fair, she supposed that living in the dim gray of Maine winters had left her esthetically hostile to bright color. A heart-felt "Thank you for coming," revealed the location of the widow to Angela’s right, her voiced fixed in Angela’s memory since their first conversation when Maggie had said haughtily, "From now on you speak to me about the boys’ visits." It had tempted Angela to retort, don’t be so damned smug, Maggie, at this very moment Zack’s probably plotting to bed me, just as he does every past lover. She hadn’t, reminding herself that revenge is a dish best served cold, or stale, or late, or something like that. Maggie would eventually encounter Zack’s contention that if he’d slept with a woman before his marriage, his later interludes couldn’t count as infidelity. Regretfully, three years after Zack and Maggie married he had bedded Angela - once. He’d arrived to get the boys while they were in school and the old dynamics of being alone on a frigid afternoon had blurred who Zack was presently married to – not that it had ever mattered to him. Maggie, who resembled Angela, wore a smart red suit, probably in deference to Zack who advocated flamboyance. She’d done something tricky with a scarf that indicated personal flair even in the midst of mourning. The widow’s eyes drifted over the crowd, past Angela, then fled backward and opened wide. Maggie extended her arms and plowed forward like a bulldozer, crushing Angela in a tight hug. Damn it, Angela thought. Bye-bye anonymity. "I hoped you’d come," Maggie whispered. Angela hugged back and whispered, "Why?" Maggie stepped away, taking Angela’s hands. Her warm smile suggested reconciliation, obviously misplaced since they hadn’t been joined together till death did them part. "We were Zack’s two wives, and know what it was like to live with him." At that moment Maggie realized that handkerchiefs held to tearful eyes were suspended in curious silence. She turned to the mourners. "This is Angela, Zack’s first wife." The crowd seemed uncertain about whether to applaud but Maggie dragged Angela to the first row of chairs, sparing everyone the decision. The previously chatty groups made their way over, ostensibly to view Zack’s body but glancing at the first wife who stared at the carpet. What was the cost of something that luxurious; probably the lifetime income of a minor author. Angela barely eked out a living writing for the local newspaper and the occasional magazine acceptance didn’t make a dent in the bills. A pair of shiny new black loafers appeared in front of her. "Mom." She looked up. David stared in astonishment at the two wives’ clasped hands. Maggie said, "I’ve asked your mother to sit besides me." "Oh," he said. He wore a new dark suit, trouser folds crisp, jacket fresh. Angela stood and put her arms around him. "I’m so sorry, honey. It’s a shock, but at least he didn’t suffer." She cringed at the banality of her words, but then, what other words were there. Martin came through the side door in an identical suit. David whispered, "Excuse me," and hurried to meet his brother. Angela watched them speak as they glanced at Maggie and her. They were red-eyed, dark circles emphasizing their lack of sleep. Both had inherited Zack’s broad frame and round cheeks, which usually imparted a sense of cheerfulness, but now there was a gauntness to their faces that wrenched at her. Their father had been a loving presence in their lives. They’d miss him dearly. Hell, she’d miss knowing he was out there somewhere in the world, which was not the same as missing him. Glancing at Maggie, she saw a mirrored concern for the boys. A surge of warmth moved though her. She allowed Maggie to take her hand again, and responded to Maggie’s tiny squeeze with her own. Maggie insisted that Angela stay with her, stonewalling protests that Angela was fine at the hotel, thus trapping her in the funeral home until closing. At six, the crowd filed out, kissing Maggie on both cheeks, mumbling "remember life goes on," commanding "Dinner next week." They looked at Angela uncertainly, then added, "You too Angela." Angela shook her head. "Thanks, but I’m going home after the service." Once everyone had gone, Maggie stretched wearily, and still holding Angela’s by-now numb hand, led her to the casket. Angela was forced to confront the face of her dead ex-husband. She took a deep breath and looked down. Zack had exuded life; devoid of that life-force his body appeared that of a stranger’s, unexpectedly stodgy and overweight. Where had the essence of Zack gone to? Tears drifted down Angela’s cheeks and she felt a sudden longing for him. Death can resurrect what’s dead, she thought, a particular intimacy that had vanished tapping at the heart one last time. "It doesn’t look like him," Maggie whispered. Angela nodded. She had one arm around David, the other held prisoner by Maggie who had her other arm wrapped around Martin. They tearfully contemplated Zack’s body, a strange sorrowing chorus line. She turned her head and saw the funeral director skulking in the hall, probably wanting to close and barbecue in his backyard in this endless summer of a state. Angela tugged at Maggie’s hand, motioned to the funeral director and Maggie nodded. Angela, wearing sunglasses, stared out the car window. Doesn’t it ever get dark here? When she’d first stepped out of the airport the sun seemed as bright as a spotlight, provoking an image of a police detective who grilled, "Didn’t you sleep with the deceased after his marriage?" Now the air was a gold-gritty haze. Maggie hummed soundlessly as she drove. The boys whispered to each other in the backseat. Angela turned to look at them and caught an amazing sight; the city of LA behind them shrouded in a cloud of dense smog, a blimp penetrating the grayness like a scene from a science fiction film. Maggie, staring at the road ahead, briefly covered Angela’s hand with her own as Angela faced forward again, then pulled into a short driveway laden with jacaranda and hedges of rosemary. "We’re here," she announced, opening the car door. Angela, trailing her, was overwhelmed by the pungent herb smell that brought to mind a chicken dinner. Maggie unlocked the front door and said to Angela, "You must be exhausted. The boys will show you the guestroom. Her face was leaden with sleeplessness as she raked hair from her forehead before vanishing into the kitchen. The boys rushed Angela into the bedroom. Martin, often spokesman for the two despite being the younger, deposited her suitcase on the bed, turned to her and said, "Mom, David and I are going to the movies, even though that sounds crazy with Dad’s funeral tomorrow." They’d taken their jackets and ties off and appeared even more vulnerable without that formality. David added, "We know it’s your first night here, but Dad struggled to keep you and Maggie apart for years and now you’re sleeping in their house and holding hands with her and it’s just all too weird." His voice broke and Martin put his arm around his brother’s shoulders and continued. "It seems disrespectful to Dad, yet it also seems right, but we’ve got to just zone out somewhere else for awhile." "Yeah," David said. "We thought we’d have to split up, one of us with each of you. Now that problem is solved." There was relief in both their eyes. "Maybe," Angela said, "that’s why Maggie invited me here." "Maybe," Martin agreed thoughtfully. "But maybe it’s for some weird psychological part of grief, like to get back at Dad for dying. Anyway, please don’t feel hurt." Angela thought with amusement, what else would I expect when he’s taking Psych One in college. She pulled them both close to her. "You’ve just lost your father. Do what you need to do." After they left, she quietly opened the bedroom door and tiptoed around the living room. She and Maggie may have looked alike, but their decorating styles were miles apart. Angela favored the exotic, her home filled with spicy rugs, Inuit carvings, Native American pottery. Her bedspread was a swath of old Japanese indigo. Zack had labeled her style "ersatz travel" and she had reminded him that if he’d had a regular job, they could engage in the real thing. Maggie’s leather sofas and chairs, posters of old masters, sleek tables, possessed a smart chic. She examined a wall of books that had to be Maggie’s, Zack would never read Dostoevsky, the history of wars I, II, Korean, Vietnam, Gulf, and those currently threatened, nor would he have had patience for the Dalai Lama. Angela wondered how Zack had enticed Maggie into marriage, but then his apologetic way of admitting his lack of intellect, tempered with confessions about his irresponsibility, inspired women to fall in love with his charming "humility." Amazing how unabashedly telling an unflattering truth could be thought endearing. She had been simpler to conquer. She was twenty-two when they met at a folk music concert and flattered that somebody so charismatic persued her. She later decided that he’d probably known she’d put up with his lack of steady employment, steady income, steady fidelity. Still, Zack was more fun to be with than anybody else; inventive, good-natured, adventurous. Now he was gone. Her chest tightened. Was it true that energy never vanished? Was Zack’s energy whizzing around the universe at its usual dizzying speed? Angela retreated to her room, closed the door behind her, changed into a nightgown and climbed into bed, book in hand. The scent of rosemary drifted in the window, lulling her into sleepiness. There was a loud crash from the kitchen. She ignored it, but was defeated by the sound of another dropped item. Duty calls, she thought, put the book down, and went into the kitchen. The boys had told her that Maggie had high-paying position as a corporate CEO, the kitchen showed it. Mexican tile covered everything; hand-painted blue, yellow and white with a pretense of humble ethnicity that screamed wealth. Maggie, now wearing jeans and blouse, was unloading her dishwasher, a bottle of red wine on the counter beside a half-filled glass. She turned at Angela’s "Hello," and said guilelessly, "I hope I didn’t wake you." "Can I help?" Angela asked. "No, the busier I keep myself, the safer I feel. Although I haven’t figured out what I’m safe from; certainly not fires, earthquakes and…and death." She shook her head, then pointed to the wine. Maggie filled a wineglass, handed it to Angela, lifted her own and said, "Here’s to Zack, probably scurrying around heaven looking for the talentless." The heaviness of her voice belied the lightness of her words. They downed the wine and Maggie poured the last of the bottle into their glasses. "To Zack, again." Angela wondered if Maggie intended them to get sloshed in Zack’s name. The widow, silhouetted by the finally diminishing sunlight, seemed fragile. Angela thought, I let Zack go long ago, but it’s new to her. Yet now that he was truly gone, she realized she’d never completely let him go, perhaps even believed they might reunite in some decrepit old age. Maggie opened a new bottle and said, "Let’s go into the living room." She brought crackers, cheese, grapes and apples. Angela settled onto the couch. It was perfect, her back supported, the cushions a precise balance between firm and soft. Maggie flicked a switch and a flame shot up in the fireplace. "Gas," she explained and settled into a wing chair across from Angela. Angela felt the desire that sometimes inflamed her at an expensively furnished room in a carelessly luxurious house, a desire to have more, to sink into spoiled comfort, to flick on the heat without concern about fuel costs. The despairing insignificance of her pride in not desiring material objects arose when confronted with Egyptian cotton sheets and Turkish towels. "Quicker than stacking wood," Angela said. "Wood?" Maggie said. She took a long sip of the wine. "Yeah," Angela said. "It’s Maine, it gets snowy, you lose electricity and subsequently heat. The winter seems longer than it is or maybe it is that long. You need a good supply of wood and stacking it can be contemplative. "Really?" Maggie smothered a cracker in Brie and held it out to her. "Absolutely; a repetitive act of piling one log onto another, the rare instance of knowing exactly the right thing to do." Angela shook her head at the cracker and instead covered one with barely a trace of the cheese. At Maggie’s cocked head she said, "The stuff is fattening." "You don’t look bigger than in your wedding picture." "You saw our wedding picture? Did the boys have it?" Maggie drained her wine, poured another glass, stared into Angela’s eyes. "Zack had it." "Oh." Angela drained her own glass and emptied the rest of the bottle into it. "Of course you were an enormous part of his life." Her eyes pleaded with Angela who offered what she prayed was an innocent gaze and said, "Zack was a pack-rat. I came across bits of his past for years: a photograph of his high school sweetheart under bags of dried beans, one of his college girlfriend under the strike-everywhere-matches, and one, beneath a spice carton, of Zack with a woman I’d never seen." "Um," Maggie said in an even voice. "You found pictures of his old lovers." "A few," she said casually. "Although they were legion." Maggie stood. "I’m going to open another bottle of wine." She vanished into the kitchen. How could I have allowed myself to be talked into staying here, Angela thought, eyeing the door. Maggie came back with an open bottle and said, "Drink up now. This is an expensive new Merlot I want to try." She settled into her chair, stared at Angela and said, "I wonder if all his old lovers bear a resemblance to us, a row of woman conveniently confused with each other, that is except for name, age and marital status. But then, let’s avoid saying anything incendiary in honor of Zack’s cremation tomorrow." She poured a bit of wine into her glass and tasted it. "Good." She leaned back in her chair and said in a voice so low it was almost a whisper, "I was at the post office when it happened. He died alone." Something twisted inside Angela who remained silent a moment. "The heart attack was so fast that he wouldn’t have felt alone more than a moment. Let go of the guilt. You woke up and it was just another day. That’s how it happens. Life changes so quickly it leaves you breathless." Maggie nodded. "Yes, I’m breathless." She took a deep quivering breath and looked at Angela. "You know, we should do this more often now that we’re friends. Only next time when our husband hasn’t just died." She lowered her glass to the coffee table and dissolved into unrestrained tears, arms wrapped around her chest as if to contain the loud sobs. Angela, still mulling over "now that we’re friends," hesitated a moment then squeezed in besides Maggie, put her arms around her, rocked her gently and, to her chagrin, burst into tears also. Angela returned from the funeral to discover Zack everywhere. The snow reminded her of building forts with the boys, then bombarding each other with snowballs. Hauling wood brought back Zack’s contests of who could haul in the most in the shortest time. In bed, looking at the frosty white stars she remembered cuddling with Zack, under down quilts. It was David’s horrified, "Dad’s cheating on you" after he overheard a phone call, that forced Angela to end the marriage. She’d felt obligated to set an example of a wife who refused to tolerate infidelity in the service of her son’s future wives; also, she was too embarrassed to stay. After the divorce, in her effort to bury her pain, she buried memories of the fun they’d had together, laughter, similar tastes in nearly everything, wordless agreements as their eyes met over the heads of friends. She’d missed the long sweep of his body, the way he’d pinch at his little rolls of fat with dismay, his long legs twined with hers at night. She had friends but dates all fell flat. She hadn’t met another man who ignited the world with Zack’s fiery brilliance and decided she’d never live with anyone else again. She’d eventually found balance, mourning what needed to be mourned, treasuring what deserved to be treasured, acknowledging that she would always miss him, but after Zack’s death something lodged in her chest, something so heavy she could barely breathe. It’s a wonder, Angela thought, that people can go on living with this feeling, that they’d even want to. When Maggie had suggested they "do this more often," Angela assumed it was rhetorical, like "having a great time, wish you were here." yet a month after Zack’s death, Maggie called about a visit. A stunned Angela responded, "Sure." She picked Maggie up at the Portland Airport, helping her with two large suitcases, neither of which contained appropriate clothing. When they stepped out into the parking lot, Maggie exhaled sharply. "So much snow, and so dark. It’s only 6:00." "Yeah," Angela answered. "Daylight savings time. Guess we didn’t save enough." Maggie, shivering in her light wool jacket, hadn’t laughed. "Walk fast," Angela advised. "Heat yourself up." "My limbs are too frozen." "You can wear something of mine. We’re the same size," Angela said. Angela gave her a tour of the house and woodshed. Maggie gazed at three walls of neatly stacked logs and exclaimed, "It’s glorious." "Like laundry or food shopping," Angela retorted. "No, seriously. It’s old Americana, pioneer stuff." "No, just being practical and broke kind of stuff. Everyone in the neighborhood heats at least part-time with wood." "It doesn’t seem like anything would provide enough heat." Maggie shivered. After donning two sweaters, fleece-lined jeans and heavy wool socks, Maggie huddled beneath a down blanket on the couch. Angela had stoked the stove up so high that she herself wore a tee-shirt and shorts. Décor? Angela thought and asked, "Ersatz travel?" Maggie’s quizzical look inspired a rush of gratitude to Zack for keeping private some elements of their marriage. "Private joke," Angela told her, then pointed to the poster and asked, "Want it?" "Good Grief, no," Maggie said. "Why did you buy it?" Angela took a sip of her wine. "I didn’t. I made a donation to the ASPCA and it showed up in the mail, like a stray kitten at the door." "Throw it away," Maggie said pragmatically. "You’re right," Angela said. "Maybe I have a bit of packrat in me." They lapsed into silence. Oh-oh, Angela thought. We’ve run out of conversation already. "So," she said. "I was delighted when you called." "I thought I’d stack wood," Maggie said. "Be contemplative. It’s hectic in LA. But I didn’t expect this cold. Our wedding here, after the one in L.A., was in the summer. I remembered Maine as green; green trees, green grass, green philosophy. But it’s brown and gray with green trim. It’s like this most of time?" "A lot of the time," Angela said. "The boys are doing well," Maggie said. Maggie said casually, "You don’t have a wedding picture out." "I’m divorced," Angela said. "He married you, and actually I saw you for the first time at your wedding." Maggie stared at her in astonishment. "What!" "I sat in my car across the street, waiting to see the woman who’d replace me at all those damned awful concerts and movies." She’d watched the flood of cars wash down the street, eyes filled with tears as old friends arrived. "You saw us arrive?" Maggie asked. "Yeah, in that giant limo filled with roses like an offering to the God of matrimony. I’ve never seen so many flowers crammed into a car." "I couldn’t stop sneezing," said Maggie. "I’m allergic to roses, but Zack kept saying, "They’re so ubiquitous. How could you be allergic to them?" "To Zack’s reality." Angela tipped her glass. "Anyway, when you got out of the car I was so grateful that you were my age, that he hadn’t swooped to twenty-year-olds who’d call him sir in bed." "Although Zack certainly did swoop to twenty-year-olds. He said they were old lovers though I can’t imagine when they could have been new lovers," Maggie said. Damn it, Angela thought, our most involved conversation have always been, Flight 767 arriving at 8:30 and Flight 922 leaving a week later, and now we’re discussing our husband’s infidelities. "Actually, I left him once before I left him," she said. She’d been overwhelmed with such loneliness she could barely wake up each morning. That loneliness filled her now. Zack was gone, no old age to rebuild a life together, not even a doddering menage-a-tois with Maggie. "I don’t even remember how I discovered the affairs, plural, although I suspected it every time a new sexual move appeared like a weed. David was just a baby; Martin not born yet. We went to my mother’s. Zack said he couldn’t believe I’d end the marriage over something so trivial. He sent massive bouquets of roses every day." She shook her head at the memory. "Five years, two years, now; didn’t you even take a break or were you seeing old lovers during our honeymoon?’ I yelled. ‘How could old lovers count?’ he insisted. ‘They count Zack.’ I was shrieking like the proverbial fishwife. He swore, ‘Never again. You think it’s infidelity, I’ll stop.’"
Maggie nodded and Angela continued, "I believed him and came back. Then after I realized that he hadn’t stopped, that like salted peanuts, he always had to have one more, I gave up." Angela poured the last of the wine into her glass and took a deep breath. She’d asked herself that question a hundred times. "Because I wasn’t lonely when he was around and he was around for all occasions like a hallmark card: birthdays, holidays, anniversaries. He came home every night. We never stopped making love. I lived in alternate realities. When Zack and I were together it seemed impossible that he was screwing around. I allowed myself to live in that particular reality until the boys discovered his affairs." The fire crackled. A shivering Maggie waited for her to continue. Angela sighed. "You know what else, it seemed like so much work to divorce him, so many details to attend to, custody, deposition of household items, child support, alimony, reassuring friends that they didn’t have to chose. I was never detail-oriented. And I was right; the divorce was more exhausting than the marriage had ever been. In fact, I’m exhausted just remembering it. Or maybe it’s the wine. I never have more than a glass." She slumped back against the chair and closed her eyes. "And one more thing, I still loved him." Maggie said, "I don’t drink this much either. It just seemed easier to be a little sloshed when we had this conversation." Angela opened her eyes. Shadows from the fire flickered across Maggie’s face as she poured herself still one more glass and stared into the flames. "For a while I became obsessed with wondering what you’d done when you found out. I wondered how you’d react if I said, the boys are on the 8:30 flight and, by the way, how did you handle old lovers?" Her voice broke for a moment. "The alternate reality thing, that I also experienced, was crazy-making, but weirdly comforting also." She shook her head, lost in memories. "I was forty when I met Zack. I spent twelve hours a day at my office and a couple of hours over the weekend. It wasn’t until I met him that I realized I was lonely. I don’t have to tell you how charming he was. I would have done nearly anything to stay married to him, and I did." "And I loved the boys." She toasted Angela. "You did a good job." "Thanks," Angela said. "And you were…are a great stepmother." "Thanks." Maggie continued, "Zack was so loving most of the time. He never implied that his infidelities were because of something I couldn’t give him. He always told me I was wonderful and perfect, but he was like a kid when he wanted something and, of course, he wanted everything. Zack was generous too. There wasn’t anything he wouldn’t share with you. And he made every damned thing fun. I’ve never had as much fun with anybody else." "How can we be discussing his infidelities without being furious?" Maggie whispered. "Are we weak women? What’s the phrase, women who love too much? Masochistic? "I never thought of myself that way, even though sometimes I wondered if I’d gone crazy," Angela said "And I’ve had more than my share of anger." "By now, maybe we’re old enough to have put it in the past, or to be philosophical, or to just be tired of anger," Angela said. "I know that I got tired of anger a long time ago and it seems like a waste of energy to conjure up all that fury now. Some friends call it denial, but it feels better than raging anger." Maggie nodded. "Mostly though it’s over, isn’t it?" "Yeah," Angela said and poured them each another glass of wine. Angela woke with a blazing headache, the evening a blurred memory of Zack stories. They’d fallen asleep in front of the now extinguished fire. The house was freezing, the woodpile empty. Maggie snored lightly, buried beneath the blankets. Angela had fallen asleep on the floor beneath an old comforter. She stood, every muscle aching, threw the comforter over Maggie and went into the kitchen. She needed a cup of coffee, hell, a whole pot. She struggled to be quiet, but things kept slipping out of her hands and a few minutes later, Maggie stumbled in. They smiled wanly at each other. "If I look like you," Maggie said, shivering. "I resemble a creature drained of its juices." "I’ll haul in some wood after coffee and get the fire going." "I’ll give you a hand," Maggie offered. Angela handed a cup of coffee to Maggie. "Go upstairs and sleep a little more." "Hell," Maggie said, taking the cup gratefully. "I’m strong." "I’m sure, but you don’t usually haul wood. It calls for muscles you didn’t know existed." "I can haul in as much as you can," Maggie said. Angela smiled. "Bet I can haul in more loads than you can in ten minutes." "Just watch me," Maggie said. "Give me a few minutes to finish this coffee, get some shoes and a jacket on, and we’ll see." "Just wear those sweaters," Angela said. She took a satisfying sip of coffee. "If you move fast, you’re going heat up quickly." They finished the pot, then Angela asked, "Ready?" Angela handed Maggie a canvas carrier, pulled open the door, stood besides Maggie and said, "Ready, on your mark, get set, go." The two women raced across the porch, skidding on icy patches, filled their carriers as quickly as possible, and raced back to the living room, bumping into each other at the door, finally collapsing after four trips, sweaty and laughing, on the couch. "Dead-heat," Angela said. "I’ll make the fire if you make another pot of coffee." Maggie smiled. "I’ll make a pot of coffee and breakfast, if you teach me to light the fire." Later, they went to L.L. Bean where Maggie bought a warm coat, snow pants, and snowshoes. They went shoeing, Maggie falling in the snow a dozen times, insisting that she was merely looking for pristine white to make snow angels. The following day, they drove to the museum in Boston, and then out to dinner. They reminisced about Zack, laughed a lot, talked about the boys. At the end of the week, Maggie extracted a promise from Angela that she’d come out to California in a couple of months. After Maggie left, Angela was surprised to discover how much she missed her. In a phone call two days after she’d left, Maggie confessed the same feeling. They were soon speaking regularly, emailing every day, discussing the boys, news, books, music, sharing work triumphs. They began to alternate visits every other month. After a year and a half, during a phone call, Maggie asked, "Angela, neither of us is interesting in remarrying. Let’s live together; summers in Maine, winters in California. I can do most of what I do on-line and you can write anywhere." Angela laughed. 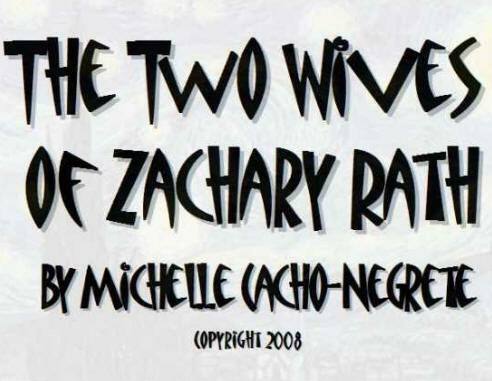 "Zack’s two wives living together." Saying his name made her realize that they had not spoken about Zack for months. "Just think about it, OK?" Maggie asked. "Hell," she laughed. "If we get bored with each other, we can always invite a few of his old lovers to join us." Angela laughed also, surprised at the levity they shared over something that had caused them both so much pain. "Promise you’ll think about it." "I promise." After Angela hung up the phone the house filled with silence. She turned on the radio, called a friend and made plans for dinner. When she came home that evening, the silence seemed deadening, the house abandoned. It had felt that way for the past year. Why not, she thought. What do I have to lose? We can have a trial period and see if it works. She was surprised at the revelation that perhaps she could be live with somebody else after all, but then, she and Zack had similar tastes in everything. Copyright 2008, Michelle Cacho-Negrete. © This work is protected under the U.S. copyright laws. It may not be reproduced, reprinted, reused, or altered without the expressed written permission of the author. Michelle Cacho-Negrete has published in a number of magazines including The Sun, Weird Tales, Psychotherapy Networker, been nominated for 5 Pushcart Prizes, her essay Heat was voted one of the 100 most notable of the year and Agni listed her essay, In My House, as an example of great writing. She lives in Maine and works both in person and online with students. She can be reached at Mcacho@maine.rr.com.